Whole Grains, Rice, Risotto, Couscous, Polenta, Quinoa, etc. The ACE Professional Cooking Program includes 30 in-class sessions, field trips, and complete school uniform (monogrammed chef’s coat, chef’s pants, skull cap & apron).A Grand Diploma is awarded to those who complete all three 10-week segments, requirements and pass the final project. 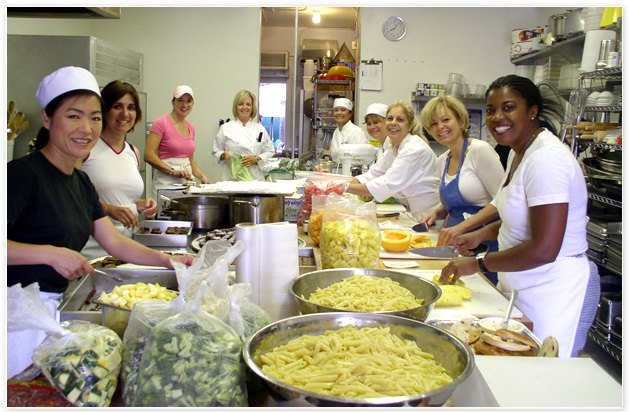 Guest chefs & former graduates may come to some classes as guest instructors or to do a special demo within the class. We reserve the right to change class order, topic, recipes/techniques of tours as listed due to unforeseen circumstances such as unavailable ingredient, guest instructor/speaker cancellation or other emergencies. Single Payment Option - $6,395.00 due upon enrollment. Includes $495.00 non-refundable registration fee. Includes $195.00 non-refundable registration fee. Complete school uniform (chef's coat, chef's pants, skull hat, non-skid shoes) required to participate in class. 48 hour notice required if unable to attend Pro Cooking class or will have to compensate food cost for make up class. Certificates will only be given to students who complete the entire course including graduation requirements. Click below to sign up for our Pro Cooking progam.